‘… Marooned at my desk, I swiveled round and round, drowning in digital static …‘ (page XIII). So many of us can relate in a personal way to Dan Rubenstein’s description of his work life in the field of journalism. When he talks about managing his stress by checking emails every few minutes, I can say, I’ve been there! Dan’s book, Born to Walk, shows us a way to change our lives in a very simple way … just walk! 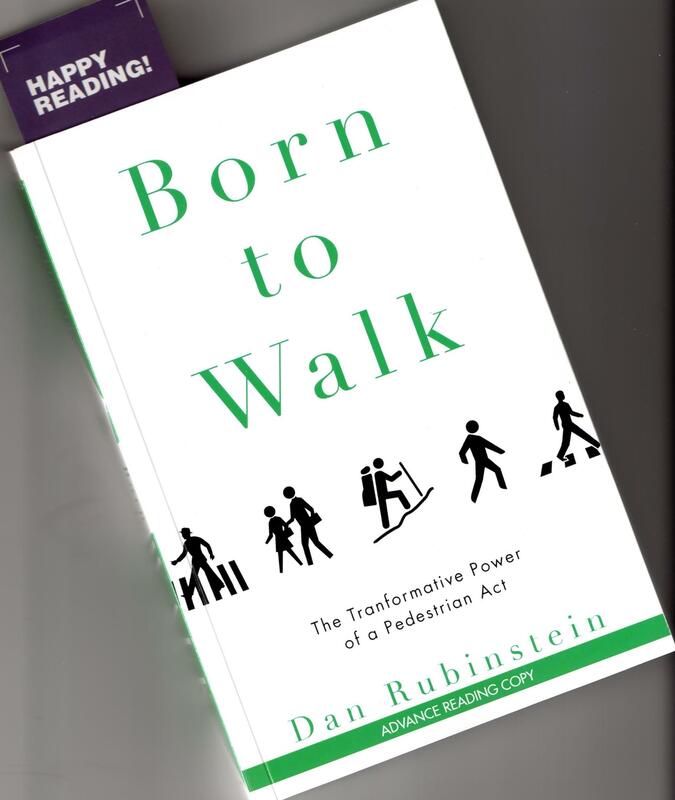 Born to Walk – The Transformative Power of a Pedestrian Act (Dan Rubinstein, 2015, ecw press, Toronto) is a book of non-fiction with a strong narrative component. It could be described as a self-help book of the environmental kind. Born to Walk describes the health benefits of walking, fitting this into the context of what it is to be human in the natural world. This book would be interesting for those who walk already and those who are thinking about taking up or accelerating a walking program. As I was reading, I often wanted to quit reading and start (you guessed it) walking. In a discussion of the benefits and pleasures of walking, Dan considers walking a key life strategy. He tells the tales of people who feel compelled to walk or who walk for a living. Dan’s credentials for writing this book become more obvious as we read – the writer has learned through doing. Over the course of the book, we learn about his interviews with some of the most outstanding walkers in the world – interviews conducted while on foot and on the trail! The walkers he tells us about include a postal ‘delivery agent’ in Ottawa, a police officer walking the beat in Philadelphia, a photographer in New York City, and a medical doctor walking between Native communities in eastern Canada. The book considers, chapter by chapter, specific topics about walking: the effects of walking on the body and mind; how society can benefit from pedestrian ways; the economic and political connections of walking; and the influences of walking on creativity, spirituality and family life. My interest in the book sparked when I read the sub-title – ‘The Transformative Power of a Pedestrian Act’. My struggle with arthritis and the inactivity that accompanies mobility problems, has convinced me that activity and walking should have been a focus of my life, especially in my thirties and forties when I started sitting more than walking. The book points out that isolation and sitting are the new smoking. In opposition to the ‘sitting disease’, Born to Walk explores the benefits walking can deliver. Dan describes the positive effects of being in nature. Sneakers, he says, are as important as medications in dealing with our many health issues. With careful consideration of the sage advice of the walkers of our time, backed up by health statistics and epidemiological studies, Dan explains how walking can improve our sense of ‘personal mastery’ and ‘self-regard’. I was intrigued by his descriptions of the experiences of those who are serious walkers – for example, the ‘green blur’ overtaking those who have been on a difficult trail for days. As a planner, I was most interested in Dan’s insightful ideas about planning for a ‘walkable city’. He describes new approaches to creating urban areas where cars and people can coexist in safety. Some of the ideas he explores include development of road-skinny cities, the benefits of ‘walking meetings’, and the possibility of finding tranquil urban spaces to make up for our lack of being in more natural locations. Reading this book was a pleasure. The narrative lines are engaging, the stories are often funny and Dan’s style is sensitive and not at all condescending. He writes with the conviction and knowledge of one who practices what he advocates. My favourite chapter of the book was definitely ‘Creativity’. As a writer, I have often noticed that the rhythms of walking inspire both the metre and cadence of poetry. Born to Walk describes ‘participatory art walks’ in Brooklyn and the ephemeral art of an ‘X’ walked into a field of daisies. ‘People get ideas when they are out walking’ (page 190). My only problem with the book is related to the way I personally prefer to read. I found the chapters long (eight chapters plus prologue and epilogue for a book of 251 pages with about 300 words per page). I tend to read in chunks and consider it a smooth read if I can take in a full chapter at a sitting. As a person with mobility problems, I applied much of what Dan said to my preferred mode of exercise (the stationary bike). While the stationary bike gives me some of the physical benefits of walking out-of-doors, I realise I am missing out on other benefits. For this reason, I am motivated to walk to the extent of my ability. One truth I read in the book is the idea of embracing and putting up with some pain as long as I am not doing damage to my joints. Born to Walk – The Transformative Power of a Pedestrian Act is a thought-provoking, walk-inspiring book. I am eager to read other books by Dan Rubenstein! 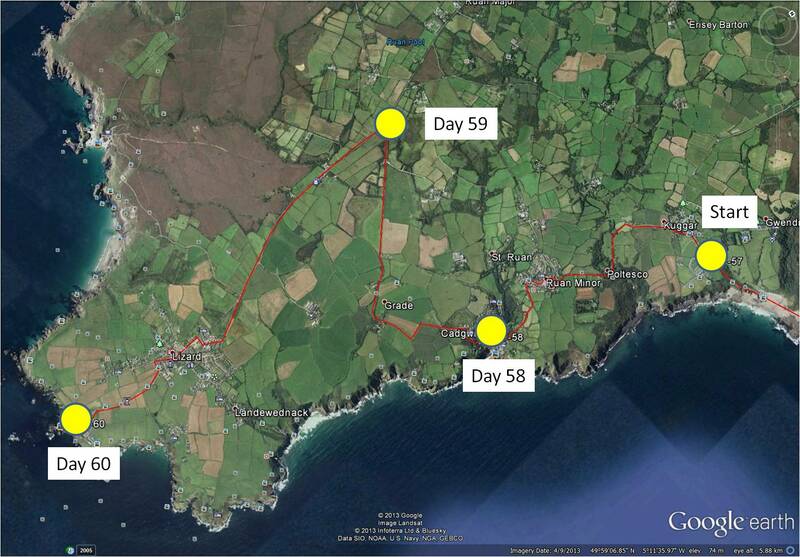 Dan has an interesting blog describing some of his adventures leading to the writing of Born to Walk ( http://borntowalk.org/ ). On December 31, 2013, I started on Phase 8 of my virtual cycling program. 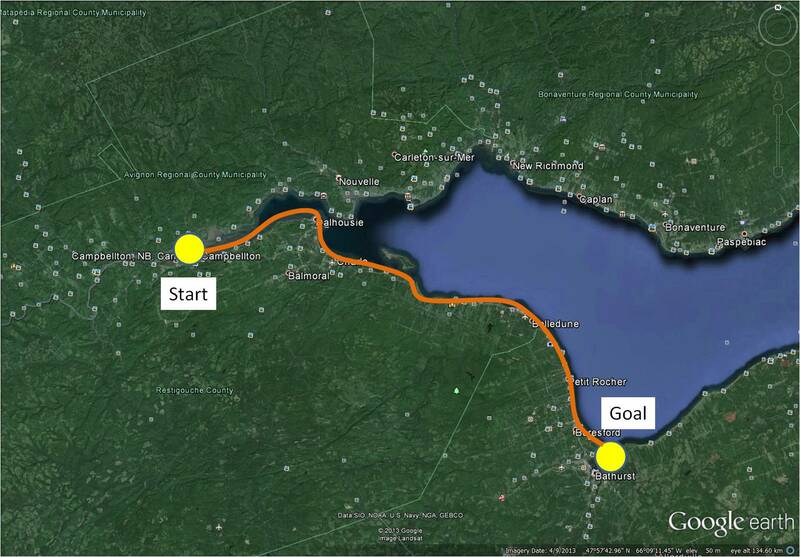 In this Phase, I am going to ‘travel’ on my stationary cycle along the north shore of my own Province, New Brunswick. I decided to start in the City of Campbellton because I have so many pleasant memories of working and vacationing in that area. 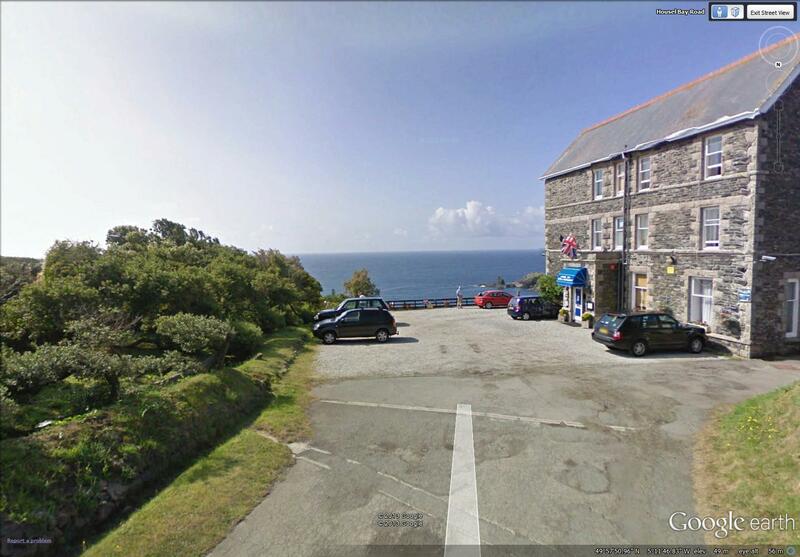 Most of the roads I am ‘cycling’ in Street View, I have driven in reality, so most scenes are familiar. 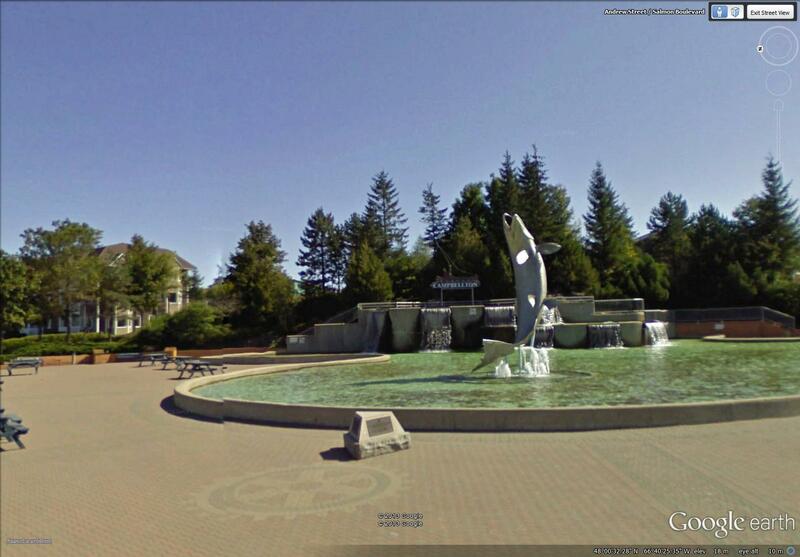 I began at a familiar landmark in the Campbellton area, the statue of the leaping salmon. The Restigouche River is world famous for its Atlantic Salmon population so the salmon is a fitting symbol for the area. 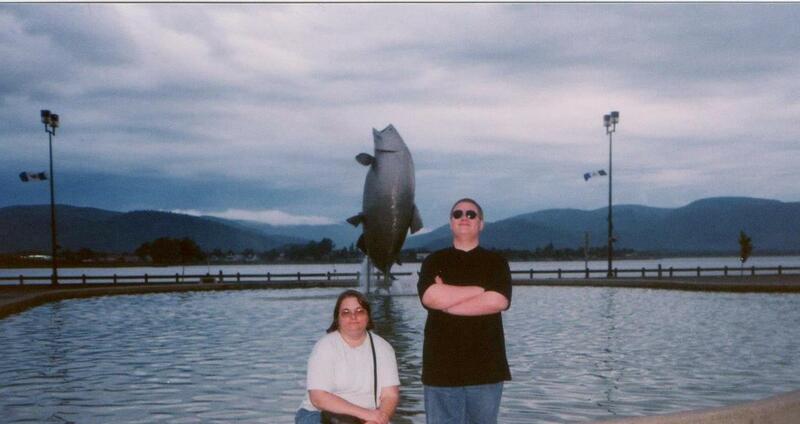 In 1999 when my husband, son and I vacationed in the Gaspé of Quebec, we stopped here for a photo before leaving New Brunswick. Across the street from the leaping salmon (and visible in the photo of my son and me) are the waters of the Restigouche River and the distant hills of the Gaspé. 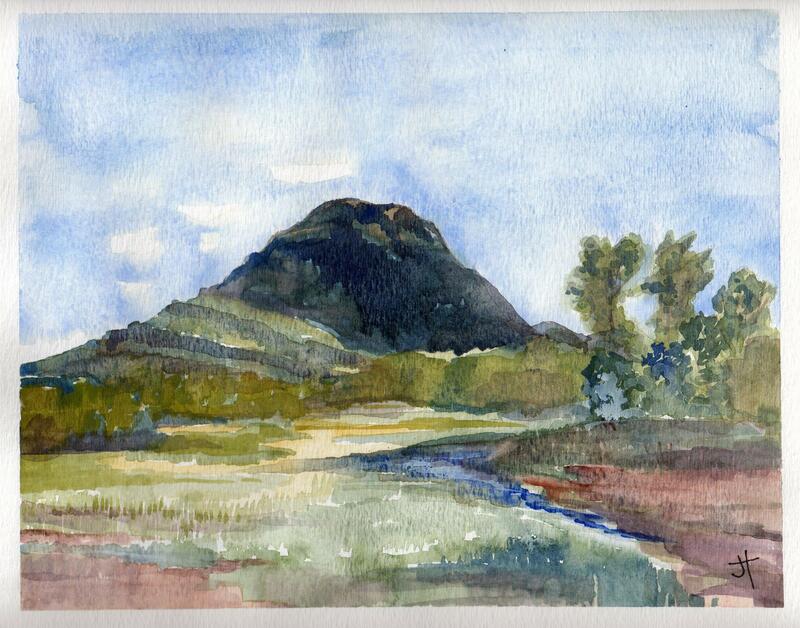 Since these will be with me for the first few days of my virtual adventure, I took a side trip a few kilometers inland for the subject of my first watercolour – Sugarloaf Mountain. Sugarloaf is 281.1 meters in height, a part of the Appalachian Mountains and of volcanic origin. The mountain is within the City limits of Campbellton and is the location of Sugarloaf Provincial Park. 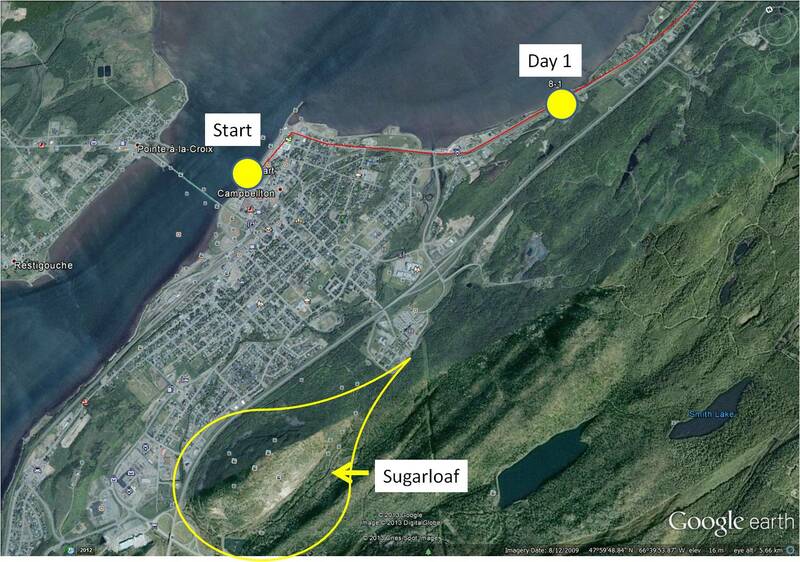 Sugarloaf is the site of a ski resort, hiking and cross-country ski trails and a system of mountain biking trails. In the late 1970’s and early 1980’s I climbed Sugarloaf a few times, gathering plants for air quality studies. 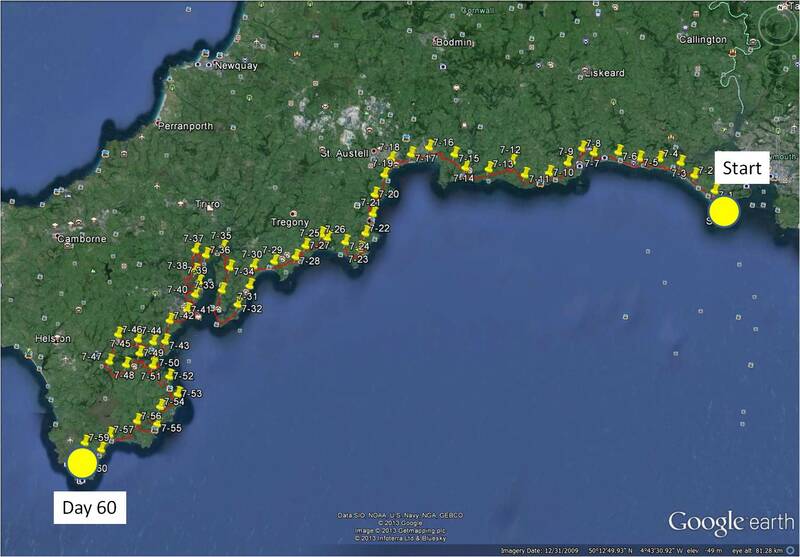 I’ll talk more about those hikes as I proceed on my virtual trip since I have many memories of working in the area. Although I enjoyed my virtual cycling in France and England, I find I have a more accurate perspective and sense of scale as I travel in New Brunswick. I am looking forward to showing you some of the beautiful scenery along the Restigouche River and la Baie-des-Chaleurs!